We have been able to tell each other that we are grateful for the things we each do in writing and the tree makes me smile every time I look at it. Recently we had a food drive at our church for our local food bank. I pulled out all of the change I could find and gave it to the kids with the stipulation that they had to find as much of a meal as they could at the store for the food drive. 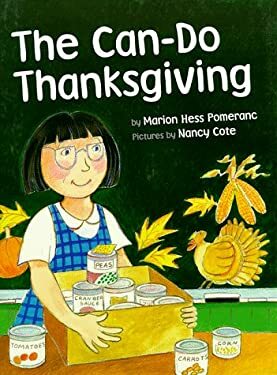 Before we left, we read the book Can-Do Thanksgiving. SUCH a sweet book! It’s the story of a can of peas and the little girl that decided to give her can of peas to the food bank and volunteer there for Thanksgiving. In our own trip to the store we spent the better part of an hour discussing the particulars of the meal. Logan was insistent on a can of peas just like in the book. Cyan decided that they needed dessert. Before we left we had the makings of a pretty decent meal. We dropped it off at the church with the other offerings. This week we are working on our Operation Christmas Child boxes. I picked up one for each kiddo and they are all planning what to put in their boxes before we drop them off this weekend for sending. It has been a wonderful month so far of watching my kids turn from wondering what they will get for Christmas to making sure that their gifts and meals are just perfect for those in need.